This holiday season, as you gather with family and friends to celebrate all the love you have in your life along with the love God has given us, I am sure it makes you really count your blessings and truly think about your blessings in life! I know it sure makes me remember that I have an abundant amount of things to be thankful for and I don't deserve any of them! This year, I am truly thankful for one of the most important people in my life...my husband! This last year has been one that has been full of changes (new baby, moving, new job, living with parents, new city/state), challenges and many new transitions for us as a family, but we have learned to lean on each other and have only grown closer as a couple and as best friends! I am so proud to say that we have been best friends since we met 13 years ago in high school! I could never have gotten through these last couple of months without him! His smile, laugh and hugs gets me through each day and and there is nothing better than seeing the way he loves and plays with our children! He is a great father, husband, and supporter of our family! THANK YOU FROM THE BOTTOM OF MY HEART FOR ALL YOU DO! YOU ARE TRULY ONE OF THE BIGGEST BLESSINGS IN MY LIFE AND I APPRECIATE ALL YOUR HARD WORK AND ALL YOU DO EACH DAY! One of the ways I thank him is by giving him sweet treats because he has a major sugar tooth! When he saw the Merci Chocolates and their delicious selection of rich, European chocolates made from the finest ingredients that I recently received, his eyes got big and his mouth watered! He absolutely loved the different flavors like the Milk Chocolate, Cream Truffle and Praline-Cream, but his ultimate favorite was the Hazelnut-Almond. It is just a small (but really tasty!) token of my appreciation, that's for sure! Who are you thankful for this holiday season??? How do you show your thanks to them? 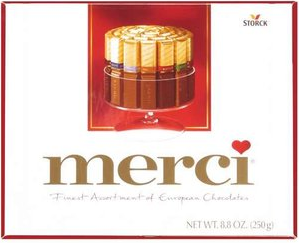 Win It: Merci Chocolates is generously offering (1) Box of Merci Chocolates to a lucky winner!